The social media session at #physio15 was a perfect opportunity to make the most of the relatively new Periscope App from Twitter. This enabled us to provide a live broadcast of the session for absolutely free, using a smart phone, and which was accessible around the world for 24 hours after the event. This blog gives some quick how to advice for setting up a Periscope account, as well as some tips for using at a conference or event based on our experience so far. Periscope is a live streaming video app. It allows you to watch or broadcast a live recording from any event, conference or activity, and this can also be viewed for up to 24 hours after. Periscope is owned by twitter, and you create a Periscope account using your twitter @name. You can record the broadcast from your phone, iPad or tablet, and view it from any handheld device or computer. Meerkat provides an alternative, but can only be viewed live and not replayed afterwards. You will need a twitter account, as you use this to create a Periscope account – create one or choose which one you want to link your broadcasts to. Download the Periscope app onto your handheld device from the Apple or Android store. Log-in with your twitter account. When you open the app you will see a bar at the bottom with 4 icons (see below) – the tv icon takes you to a screen with live broadcasts from people you are following; the globe icon to all live broadcasts from around the world; the camera icon to broadcasting functions; and the people icon to your account details and settings (select top right icon) and a list of suggestions on who to follow. Follow a few accounts to get a feel for how people are using it and watch some broadcasts. Be curious – have a play with settings and buttons, you’ll soon get a feel for how it works. Short of recording yourself in the shower you’re unlikely to get anything disastrously wrong (see cons…). To record a broadcast select the camera icon on the bottom menu bar, add your title and click on the red ‘start broadcast’ bar (it can take a few moments for this bar to appear). To stop broadcasting swipe down from the top right hand corner and select stop recording. As you start broadcasting the app will tweet a hyperlink to the broadcast for people to click on and watch. You can also share this afterwards, for up to 24 hours. The hearts function is like applause – people watching can tap the screen to create hearts to indicate their appreciation of the broadcast. On a handheld device you can view a broadcast directly from the Periscope app or through a link on twitter . If on your computer/laptop you click on a the link provided in a tweet, and this should take you to view on the Periscope website. Make sure you do a few practice runs to get used to how it works – check you know how to add a title, start, stop, share the broadcast link etc. Get permission to broadcast from both the conference organisers and individual speakers. Promote that you will be live broadcasting from the event in advance – in blogs, twitter etc. On the day make sure your phone/iPad/tablet battery is fully charged; if using your phone think about putting all incoming calls on divert while you are recording – an incoming call can disrupt your recording. If you’ve got a good 4G signal at the event use this instead of conference internet access. Consider a separate broadcast for each speaker – this will help viewers choose what they want to watch and help get round lack of rewind/forward function. Each time you broadcast make sure you provide a clear and different title – include speaker, topic, event name and hashtag. If you can’t broadcast a presentation think about using Periscope to record a short interview with the speaker instead. Promote the link to the broadcast after the event, share widely and with key people. If you want a video that last longer than 24 hours as well as livestreaming consider YouTube as well or instead. 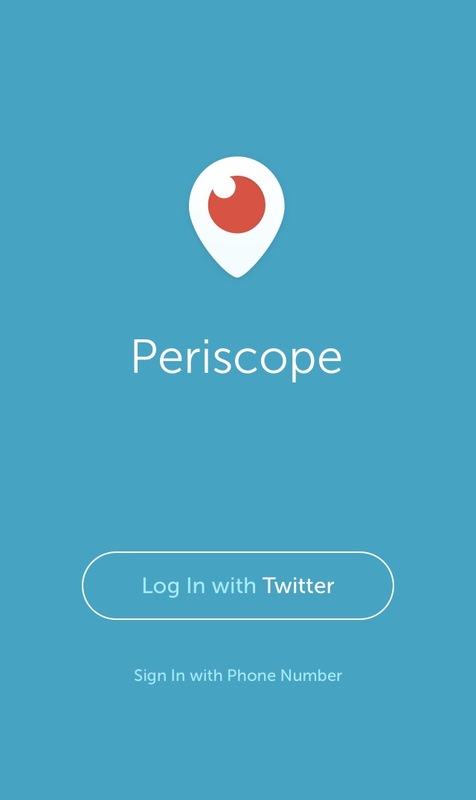 What is Twitter’s new Periscope app? We hope this is useful – let us know your comments, questions or suggestions and we’ll make some edits and then add this as a permanent page to the website. I was watching this in the room next door as I arrived there too late to grab a seat. The gap between finding out the session was full and settling down to watch the first speaker was less than five minutes. Considering I’d never used Periscope before, nor had the app on my iPad, I found it a remarkably quick and simple solution. Top marks to the team for working around the challenge promptly and creatively! The quality of the broadcast was definitely good enough for a conference presentation. We lost the signal a few times – I don’t know if that was at our end or in the other room – but it didn’t take long to come back. I’d suggest warning the audience that questions will be broadcast as well as the presentations. That might already be covered by the conference T&Cs, but still worth making it clear. We’ll certainly look for opportunities to test this out ourselves as broadcasters. Thanks for introducing us to the app.